Real Madrid’s game against Espanyol saw VAR intervene to correct referee Mateu Lahoz, who initially disallowed Marco Asensio‘s opening strike for offside. The video refereeing system proved that no such offence was committed and the goal was allowed to stand. Asensio was played onside by Didac Villa when Luka Modric shot from distance, with the ball deflecting off of Naldo and into the path of Asensio to blast beyondDiego Lopez. 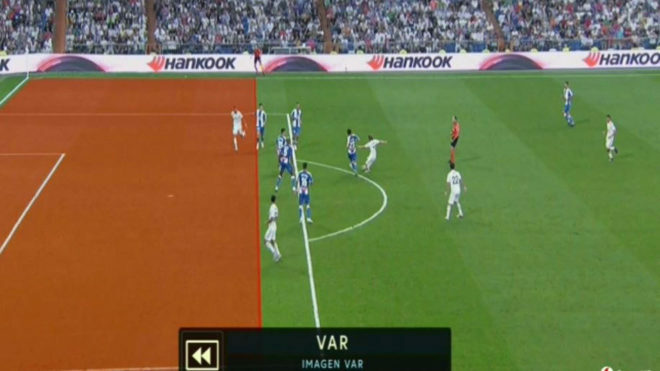 VAR‘s offside line clearly showed that there was no offside in the move, with the goal being completely legal and giving Real Madrid the lead just before half-time, the goal proving the difference in the game.